Wiseman's studies were incredibly revealing. 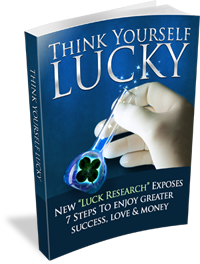 They uncovered four key strategies that "lucky" people enjoy - and discovered that by using these more, your luck naturally increased alongside. Since then, further meta-studies - incorporating some of the latest psychological research and scientific data available - has shown that these methods actually stretch to seven "key steps" to becoming a seriously luckier person. These simple steps involve making gentle, deliberate changes to the way you act and deal with the world around you - and then noticing how quickly these make a positive effect on the luck in your life. These are ROCK-SOLID changes too: not just delicate "think positively"-style suggestions that lack any concrete evidence. These are proven methods that WILL rocket your good fortune, permanently. Can you imagine being able to actually become LUCKIER, just by changing your mindset? Can you imagine being able to actually Think Yourself Lucky? Now, for the first time ever - YOU CAN. Nick Daws is one of the world's most prolific authors. With over 80 books to his name, Daws has written many times on the topic of psychology, and has performed numerous meta-studies on the topic of luck. In 2019, he came up with a final list of seven, scientifically-proven traits that the "luckiest people" in the world enjoy - based on the award-winning research of Wiseman, Kashdan, Wenger, Lyumbormisky, Losier, Mohr and Moore, to name a few. These aren't intangible principles, such as "Think positively and you'll feel luckier!" Instead, these are actual, definable, definitive actions that you can take to quickly, easily and scientifically become a luckier person. Whether you consider yourself an unlucky person, and wish to improve your fortune - or you just want to boost your existing good luck EVEN FURTHER, these techniques will work for you. And best of all, these techniques are all based on science - not on New Age thought principles, or other intangible concepts. It's real: and it's all exclusively inside Nick Daws' brand new audio course. 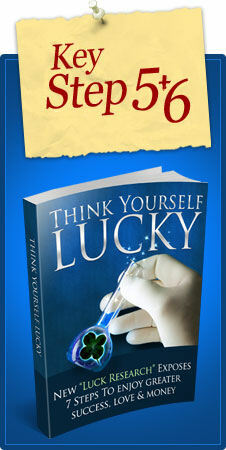 "Think Yourself Lucky" is the latest psychology course from best-selling author, Nick Daws. 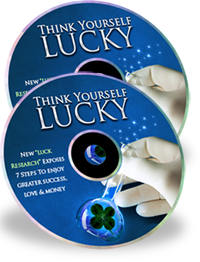 This user-friendly audio course documents the science behind luck - and demonstrates how you can practically use its principles to rapidly boost the luck in your life. Presented on two audio CDs or MP3 Downloads, with a matching PDF workbook, this fascinating course will introduce you to the world of luck, and explain the science behind some of the most curious "luck" experiments performed so far. Then, most importantly, it will show you the very precise ways in which YOU can apply this research - to quickly and efficiently increase the amount of good luck in your life! But let's be clear on one thing. This is NOT a course on winning the lottery. Such games are pure chance, and cannot be influenced. Anyone with claims to the contrary is likely a fraudster. This is a course about luck - and how you can positively influence your own! In this unique audio course, you will learn how you really can BECOME LUCKIER - in your career, your money, your friendships, and - yes - your love life as well. And you'll uncover how you can achieve all of this in just SEVEN Key Steps. 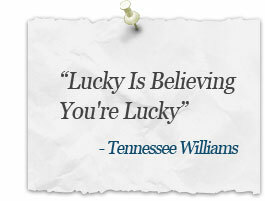 Why just 10 PERCENT of what we usually think of as luck is down to random chance! How applying 'Key Step One' helped an unemployed IT trainer named Suzi find the job of her dreams - as well as collecting a big compensation payment from her previous employer who "let her go"! Why lucky people typically have a more relaxed, less anxious, approach to life than unlucky people - and how this helps them to attract more luck into their lives! A simple, five-step technique you can use to bring calmness and clarity into your life - that takes only TEN MINUTES to perform! A DEAD SIMPLE METHOD for letting go of negative emotions that are holding you back. Until you've tried it yourself, you won't believe just how powerful this technique can be. In Key Step Two, the ASTONISHING TRUTH about where most luck comes from - you'll slap your head in amazement when you realize how obvious and yet crucial this knowledge is! What a lost dog in a temple can teach us about the importance of considering how we appear to others. Ten tips for ensuring that you come across as approachable - and three exercises to help boost your confidence and connect with more people. Six tips for using online social networking to help boost your luck even further. In Key Step Three, the one little word you should say A LOT MORE OFTEN - and how it can open the door to let more luck into your life! Why life is like an ORCHARD - and the one key thing you MUST do to keep on finding ripe, lucky apples! A surprising exercise to bring more randomness into your life - it MAY take you out of your comfort zone - but it will also DEFINITELY bring you more opportunities to get luck on your side! In Key Step Four, why lucky people trust their intuition - and how you can ACCESS YOURS TODAY and start to benefit from its inner wisdom. A guided meditation to help you tune into your intuition whenever you have a difficult decision to make. An amazing, little-known technique for boosting your intuitive powers and harnessing the power of your subconscious mind. Studies show that this will even boost your IQ as well! In Key Step Five, how to create virtual LIGHTNING RODS to attract luck into your life - and five top tips for ensuring that they channel ALL THE LUCK YOU COULD EVER REQUIRE! One note of caution to bear in mind when applying the advice in Key Step Five - and how going into "helicopter view" can protect you from making this mistake. In Key Step Six, THE ONE KEY DIFFERENCE between lucky and unlucky people in the way they think - and what you can do today if you're currently thinking like an unlucky person. In Key Step Seven, the big difference between lucky and unlucky people in how they respond to setbacks - and a three-step method you can use to quickly get back on an even keel when bad luck strikes. The surprising difference between lucky and unlucky people when it comes to superstition - and how this may be causing you to shut good luck out of your life. Plus a powerful FIVE-STEP STRATEGY for beating superstition and tackling bad luck constructively. Seven great ways to distract yourself when bad luck strikes and get your life back on track again. A no-nonsense five-step action plan for overcoming bad luck and turning it into good luck instead! How to be LUCKY IN LOVE - we explain how to apply each of the Seven Key Steps in the romantic arena. Plus five more Top Tips for ensuring that Lady Luck really is on your side where your love life is concerned. How to be LUCKY WITH MONEY - this section features TEN TOP TIPS for improving your luck in financial matters, all derived from the ultra-powerful luck-building principles set out in the course. You'll never dread opening a bank statement again! What is "Empty Wallet Syndrome" and why it can send you into a spiral of financial gloom - plus a fiendishly simple tip for beating EWS and getting your finances back on an upward trajectory again! Why a very old saying about money is more true than ever today - and the ONE THING YOU MUST DO once your financial luck changes for the better, to ensure that you continue to build on your good fortune, rather than let yourself slip back again. The Luck Questionnaire - use this to identify EXACTLY which of the Seven Key Steps you need to focus on, to ensure that your luck grows at the quickest possible rate! Your Luck Log - print this out and use it to record the lucky things that happen to you every day - follow the advice in the course, and you'll have to start writing smaller and smaller to fit them all in! Worksheets and checklists for all the main luck-boosting techniques taught on the course - along with handy summaries to remind you how to apply them. Your "Lucky in Love" checklist for singles - a checklist of places and methods to try for finding a compatible partner. Use this in conjunction with the advice in the audio to greatly multiply your chances of finding THE PARTNER OF YOUR DREAMS! A selection of methods and resources you can use to find a new and (much) better job. Again, use this in association with the advice in the course to FAST-TRACK YOUR CAREER! Your "Luck and Money" checklist - these "enriching" tips will help ensure that money worries are soon a thing of the past for you! Further reading and resources, plus a selection of inspirational quotations on luck and related matters - if you need a pick-me-up at any time, just read these great quotes and be INSPIRED! Are you ready to seriously improve your luck?